The best wireless speakers on the market have been given a bad wrap for several years because of their overall instability and poor sound quality. Fast-forward to today, and users still wireless speakers, but there are certain models that are more reliable. Basically there are two kind of cable-free setups, there are the actual wireless speaker sets, and then there are the kits that turn a wired speaker system into a cordless one. We’re going to focus on the specifically models that are ready to go out-of-the-box. While the other kind can be handy, ultimately they require set up time and proper range to operate correctly – not to mention another set of speakers to buy. The JBL On Air Control 2.4G claims to be wireless, but it does need some wiring to get the best out of the system. However, this system is one of the few cordless speaker sets to actually produce high quality output that is comparable to a wired speaker set. The system includes speaker power cables, a cable-free receiver power cord, and a single speaker wire that runs between both speakers. Users can connect through an RCA port in the cable-free input, or with a mini jack, using the included adaptor. Users like this system, rating it four and a half stars on Amazon. Some owners have noted that the speaker set can interfere with a WIFI network, often shutting it down. Most users also note the cable limitations. However, almost every owner notes that the sound quality is above and beyond other wireless speakers. 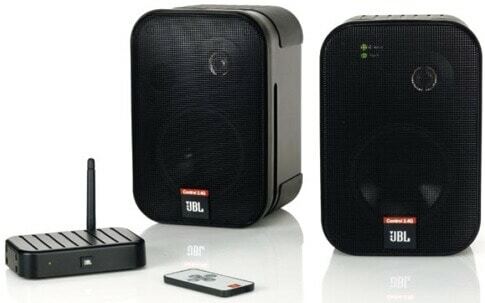 The JBL On Air Control 2.4G is available at Amazon for $299. The Griffin Evolve can cherish its boast that it’s one of the only truly cable-free wireless speakers. Featuring an iPod dock, a line in for external sources, as well as RCA inputs, this system is very versatile. The speakers are fully movable, and yield a great sound stage. The only downsides are that the speaker batteries can’t be replaced, and the remote is quite simplistic. There is a neat stereo/mono switch that allows users to place speakers in different rooms to get more coverage. Users really appreciate the sound quality and total cable-free approach, but the lack of replaceable batteries can often slow a party down when a charge is needed. With a four and a half star rating on Amazon, most owners really love the sound quality and the versatility. Some users have noted that the bass is a bit weaker than other systems, however. The Griffin Evolve is available at Amazon for $350. The Rocketfish Digital feature a wireless transmitter in each speaker. Users can even hear their music when the source is in another room. The speakers are free of unsightly antennas, and they both feature four-inch woofers and 1-1/2-inch tweeters. This set carries an 80Hz – 20kHz frequency response, and each speaker sports a volume and speaker selector switch. Users can either utilize the A/C power cord for each speaker, or use eight C batteries to keep it completely cable-free. Users like these speakers, noting that they may not be high fidelity, but they provide plenty of volume and range to be worthwhile. While a couple users complained that the system lacks a remote, not every wireless system features one. Another user mentioned the lack of a mini jack prevents use with an iPod, but the can be resolved with a proper adaptor. The Rocketfish Digital is available from Amazon for $99. The Creative Inspire S2 features Bluetooth integrated into the system for cable-free audio streaming. Its subwoofer provides a decent low end, and the Bluetooth dongle that’s bundled can be connected to a PC or MAC. While the system isn’t completely wireless, users have to connect the satellite speakers to the subwoofer, its still quite convenient if the Bluetooth is working properly. Owners like the sound quality and the use of the dongle, but many users mention shoddy Bluetooth reception or problems with this feature. For some reason the speakers have trouble holding a connection to the dongle in certain environments, but this could be due to the presence of other electronics. Some users also noted being disappointed in the lack of an actual wireless setup. The Creative Inspire S2 is available at Amazon for $109. While the subject matter is subjective, you do a nice job of offering options that seem to be better than average choices.